Patented validation feature automatically guides form or check into the printer. The Ithaca BANKjet 1500 color inkjet printer. Quicker, cleaner and quieter than any impact in the financial services industry, the Ithaca BANKjet 1500 is packed with convenient, real-world features. Based on proven inkjet technology in use in the retail world, BANKjet 1500 prints in your choice of red, black, green or blue- in any combination of two colors- thanks to a high capacity, 7-million character Hewlett-Packard cartridge. Engineered for easy, worry free operation, the BANKjet 1500 comes with a standard 2-year warranty, complete with extended maintenance options. And, of course, the BANKjet 1500 is backed by our solid reputation for quality and reliability. 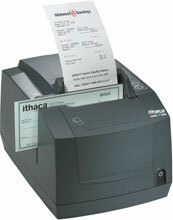 The Ithaca 1500BJ/USB-BR-AC-DG is also known as Transact Ithaca	1500BJ/USB-BR-AC-DG	or 1500BJUSBBRACDG	.